On 3 February 2017, Australian television broadcaster Foxtel televised a highly anticipated boxing match between two well-known boxers, Danny Green and Anthony Mundine. To watch the fight, viewers were required to subscribe through Foxtel and pay a fee to watch the fight live on TV. Australian resident Darren S harpe was a genuine Foxtel subscriber who paid the required fee to watch the fight live. For those who aren’t exactly sure what live streaming is, it’s the ability to broadcast audio and video as it happens. Any time you want to “go live” you can and anyone watching your posts on Facebook can see you, or whatever it is you are streaming. Sharpe made the mistake of using his phone to record the fight and stream it live through Facebook Live. While he was live streaming the fight, Sharpe received a call from Foxtel asking him to stop. It was reported that he said he couldn’t, because he has 70,000+ people watching it, which was exactly Foxtel’s point. While Sharpe was allowing a bundle of people to watch the fight for free, Foxtel and all those Sports Bars out there were losing revenue. When Sharpe refused to stop the streaming, Foxtel immediately suspended his subscription, himself and his followers missing the rest of the fight. Sharpe did what he did on purpose, and continued after receiving notice of infringement. You should also be aware of the risk of accidental infringement. You might have seen some television shows blur posters, signs, t-shirt branding and other images. It is usually because what has been blurred is protected by copyright and the producer didn’t get permission. It is easy to blur a background image when you have the ability to edit, but not in live streaming. If you infringe someone’s copyright, even accidentally, there can be consequences you didn’t anticipate. Should Facebook be responsible for copyright infringement? One side of the argument is that Facebook should be more responsible for what users post as it has the ability to police the content on its website and act quickly to disable infringing material. On the other hand it is costly and time-consuming to monitor the Facebook page of over 1 billion users. Facebook terms and conditions do require all users to have permission to use the content they upload, whether written, audio, video, or as is now available, through live streaming. United States legislation requires online service providers, such as Facebook, to take action against copyright infringement. 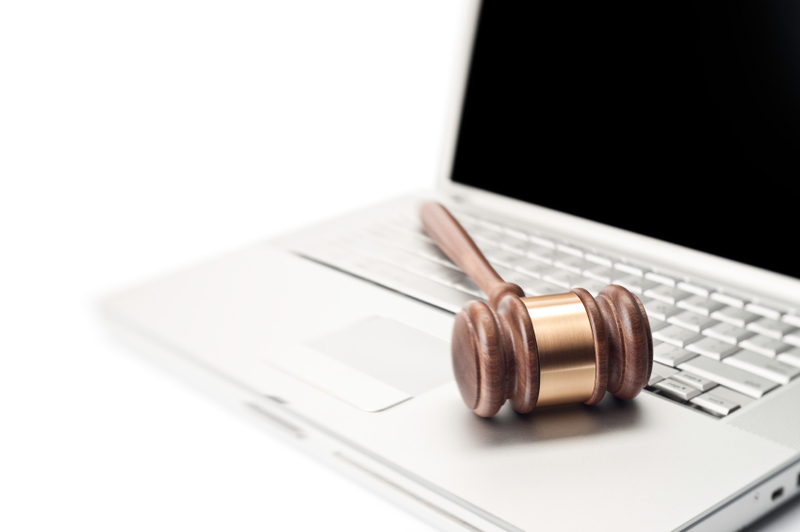 The Digital Millennium Copyright Act (“DCMA”) exempts online service provides from liability for copyright infringement by its users in certain situations. There is no Australian equivalent. 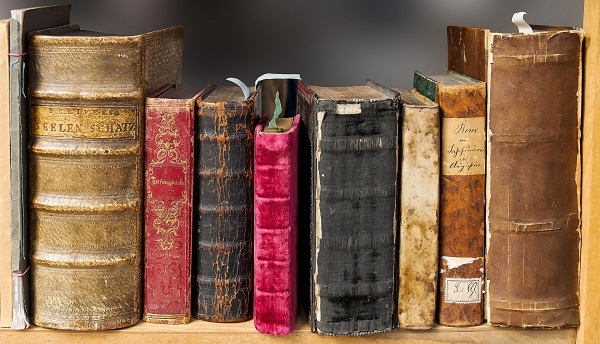 The exemption requires online service providers to take down, remove or disable access to infringing material where it is given notice that offending material has been posted on its network. It is clearly working. Facebook’s copyright policy provides rights holders with an easy mechanism to give notice to Facebook that intellectual property have been infringed and have the offending material removed or have a user’s profile disabled. Can Facebook be over zealous in taking down infringing content? 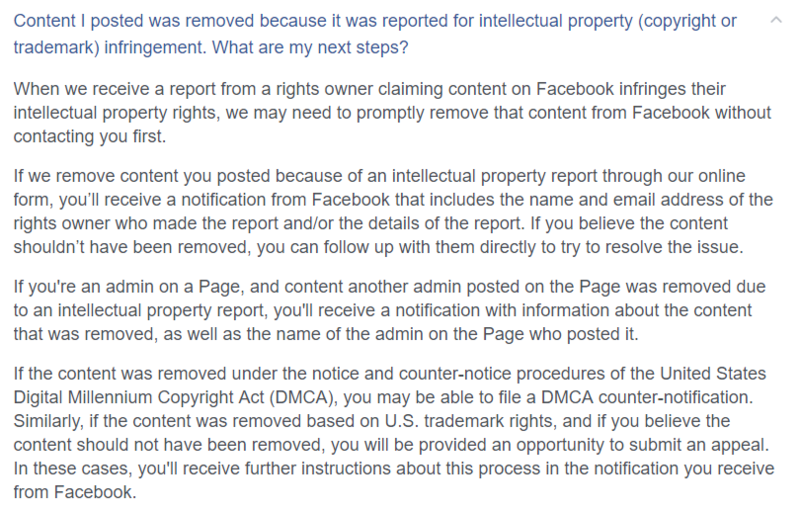 Has the DCMA and its safe harbours caused Facebook to be over zealous when taking down material and disabling profiles? Facebook page administrators are given no warning that the page would be shut down. Anybody with an email address, real or fake, can make a complaint to Facebook without having to validate the claim, effectively giving anyone the ability to shutter any page without proof. Facebook has suffered criticism in the past (Huffington Post) for shutting down pages where copyright has been alleged, when in fact no copyright infringement existed. The above extract of Facebook terms shows the ‘hands off’ approach taken by the company after Facebook has removed content. What is worse, is when a business page is removed without warning, taking potential customers and contacts with it. In late 2017 a Queensland client had their page removed and received email notification from Facebook referring them to the company that lodged the complaint. In this instance, the rights holder had a trade mark registered in the United States. Intellectual property rights are not granted worldwide. The Queensland company had the same trade mark registration pending in Australia. Facebook appears to be very U.S.- centric in how it reviews rights. The help centre information suggested that an appeal process would be available, but then failed to respond to any communication. Facebook’s aggressive stance on copyright and trade mark infringement may hinder the impact of genuine rights holders. Where someone in the United States and Australia have the same trademark in respect of similar goods, both are equally as enforceable as each other in their respective territories. Facebook has put the onus back on rights holders to work the details of the infringement out for themselves. Their copyright policy states that users can follow up (by email) with the person who alleges the infringement. It also provides guidance on how to file an appeal if the content was removed due to a take down notice under the DMCA. Facebook’s policy surrounding two legitimate rights holders is not clear but it appears they are acting cautiously. It may be the case that whoever gets in first to lodge infringement with Facebook may be the winner. However, in the case of live streaming, Facebook’s response time might simply not be quick enough to protect their interests and alternate avenues will have to be explored. If you have any questions about copyright or trade marks, contact us to find out how we can help.